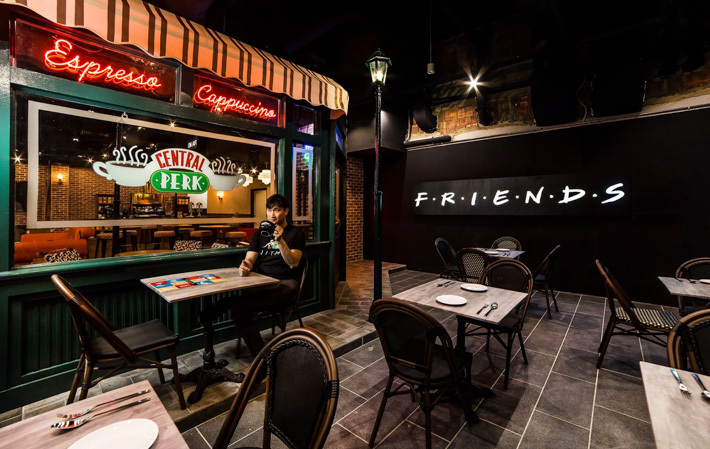 Central Perk—F.R.I.E.N.D.S themed cafe—is finally opening in Singapore this weekend. Located at Central Mall, it will be a 100-seater cafe with floor space of 3,300sq feet. Other than the main set of the café, there is also an extension of a studio set area and outdoor alfresco Streets of New York (recreated indoors). The F.R.I.E.N.D.S corner will feature character themed wall and iconic themed furniture—Patsy the dog, Pacman machine, Monica Kitchen and Joey Italian Fine craftsmanship cabinet. The cafe is partnering coffee roasters in Singapore to customise 6 different coffee blends profiled to the 6 different F.R.I.E.N.D.S. characters. Fans of F.R.I.E.N.D.S. will be happy to know that there will be Central Perk merchandises including tumbler, cap, apron, umbrella, mug, and personalised T-shirt. Central Perk ran into controversy when it announced that it was launching an annual membership programme at S$1,000. Central Perk SG members enjoy the benefits of priority queue (wow?! ); reservations for the “highly anticipated” Central Perk couch; invitations to Central Perk SG events (SO EXCITING!!! ); and 6 complimentary cups per day. Many people slammed the cafe for charging such an exorbitant amount for the membership; it remains to be seen if fans of F.R.I.E.N.D.S would spend so much to be a member (FYI: they sold 97 memberships till date). R THEY OFFICIALLY OPENED ALREADY!! !